Jalili Sadrabad, Somayeh, Yazdanniyaz, Amirhasan, Jalili Sadrabad, Samaneh. (1392). In the Face of Gentrification: Case Study of Tehran (Behjatabad Neighborhood). معماری و شهرسازی آرمان شهر, 6(10), 201-209. Somayeh Jalili Sadrabad; Amirhasan Yazdanniyaz; Samaneh Jalili Sadrabad. "In the Face of Gentrification: Case Study of Tehran (Behjatabad Neighborhood)". معماری و شهرسازی آرمان شهر, 6, 10, 1392, 201-209. Jalili Sadrabad, Somayeh, Yazdanniyaz, Amirhasan, Jalili Sadrabad, Samaneh. (1392). 'In the Face of Gentrification: Case Study of Tehran (Behjatabad Neighborhood)', معماری و شهرسازی آرمان شهر, 6(10), pp. 201-209. Jalili Sadrabad, Somayeh, Yazdanniyaz, Amirhasan, Jalili Sadrabad, Samaneh. In the Face of Gentrification: Case Study of Tehran (Behjatabad Neighborhood). معماری و شهرسازی آرمان شهر, 1392; 6(10): 201-209. 1M.A. in Urban & Regional Planning, Faculty of Architecture & Urban Development, Shahid Beheshti University, Tehran, Iran. 2M.A. in Urban & Regional Planning, Faculty of Architecture & Urban Development, Tehran Art University, Tehran, Iran. 3Ph.D Candidate in Urban Development, School of Architecture & Environmental Design, Iran University of Science & Technology, Tehran, Iran. Bahjatabad and Saeei Complex. (1973). ministry of roads &urban development, Iran, Tehran. Beauregard, R. (1986). The Chaos and Complexity of Gentrification. In Gentrification of City, (eds.) N. smith and P. Williams, 35-55. Boston: Allen and Unwin. Cameron, S. (2003). Gentrification, Housing Redifferentiation and Urban Regeneration: ‘Going for Growth’ in Newcastle upon Tyne, Urban Studies, 40 (12). Clark, E. (1988). “The Rent-Gap and Transformation of The Built Environment: Case Studies in Malmo 1860- 1985” in Geographiska Annaler, 70B, 241-254. Diane K. Levy, Comey, J. & Padilla, S. (2006). In the Face of Gentrification: Case Studies of Local Efforts to Mitigate Displacement, The Urban Institute Metropolitan Housing and Communities Policy Center, Washington. Elmas, A. E. (1999). Cihangir de Eski Evlere Ragbet Cok. Adre 17, 14-21. Freeman, C. & Cheyne, C. (2008). Coasts for Sale: Gentrification in New Zealand, Planning Theory & Practice, 9(1), 33–56. Evaluation of Residential High-Building, vision of residents and managers, mass housing. (2003). 3 (9, 10), summer 2003. Gilbert, A. & Gugler, J. (1993). Cities, Poverty and Development, Oxford: Oxford University Press. Godfery, B J. (1988). Neighborhoods in Transition: The Making of San Francisco’s Ethnic and Nonconformist Communities, Berkeley: University of California Press. Ha, S-K. (2001). Substandard Settlements and Joint Redevelopment Projects in Seoul, Habitat International, 24(4), 385-397. Ha, S-K. & Kim, T. (2001). 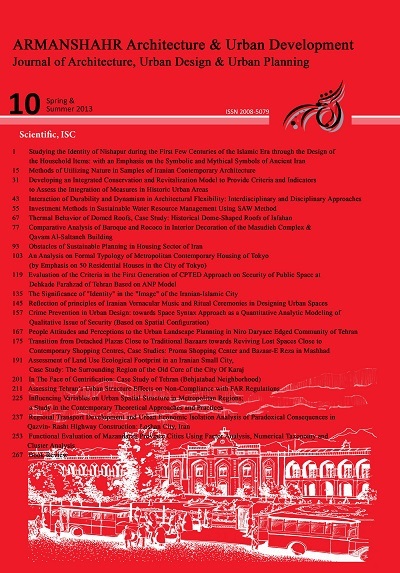 Socioeconomic Characteristics of Reoccupied-Residents in Housing Renewal Estate in Seoul, Journal of the Korean Regional Development Association, 13(3), 65-82. Hamnett, C. & Butler, T. (1994). “Gentrification, Class, and Gender: Some Comments on Warde’s Gentrification As Consumption” In Environment and Planning D, 1994, 12, 477-493. Hamnett, C. (2003). Gentrification and the Middle-class Remaking of Inner London, 1961–2001, Urban Studies, 40 (12). Hello neighbourhood journal. (1974). Internal Monthly Magazine of Complex Resident, Iran, Tehran. Kariman, H. (1986). Tehran past, present, Tehran. Keating, W. D, Krumholz, B & Star P. (eds.) (1996). Revitalizing Urban Neighborhoods, Kansas: University Press of Kansas. Kennedy, M. (1996). Transformative Community planning: Empowerment Through Community Development, Planner Network 118, 12-13. Kennedy & Leonard. (2001). “Dealing with neighbourhood change: A Primer on Gentrification and Policy Choices” – www.brookings.edu/urban [link now unavailable]. Lee, C-M., Lee, J-H. & Yim, C-H. (2003). A Revenue- Sharing Model of Residential Redevelopment Projects: The Case of the Hapdong Redevelopment Scheme in Seoul, Urban Studies, 40(11), 2223-2237. Ley, D. (1986). Alternative Explanations for Inner-City Gentrification: A Canadian Assessment, Annals of the Association of American Geographers, 76 (4), 521-535. London, B. (1980). Gentrification as urban reinvasion: some preliminary definitional and theoretical considerations, In Back to the City. (eds.) S. Laska & D. Spain: 77-92. New York: Pergamon Press. Marcuse, P. (1986). “Abandonment, gentrification and displacement: the linkages in New York City” in N. Smith and P. Williams (Eds) “Gentrification of the City” p. 153- 177 – Allen and Unwin. Millard-Ball, A. (2000). Moving Beyond the Gentrification Gaps: Social Change, Tenure Change and Gap Theories in Stockholm, Urban Studies, 37 (9). Moran, j. (2007). Early Cultures of Gentrification in London, 1955_1980, Journal of Urban History 2007; 34, 101. Ozkan, o. (1998). Policies and Processes of Urban Regeneration in Turkey, Ankara. Slater, T. (2003). Comparing Gentrification in South Parkdale, Toronto and Lower Park Slope, New. York City: A ‘North American’ Model of Neighbourhood Reinvestment? Smith, N. (1979). ‘Toward a Theory of Gentrification a Back to the City Movement by Capital, not People’, Journal of the American Planning Association, 45(4), 538 — 548. Orthodoxy: Invitation to a Debate, Gentrification of the City, Unwin Hyman Ltd.
Smith, N. (2002). New Globalism, New Urbanism: Gentrification as Global Urban Strategy, in Spaces of Neoliberlism, (eds.) N. Brenner and N. Theodore, Malden: Blackwell Publishing. UNCHS. (1996). An Urbanizing World: Global report on Human settlement, Oxford: Oxford University Press. Uzun, N. (2001). The Impact of Urban Renewal and Gentrification on Urban Fabric: Three Cases in Turkey.